Over the past four years, Advance CTE has been tracking how states value career readiness within their federal and state accountability systems, shared in our bi-annual report, Making Career Readiness Count (released in 2014 and 2016), in partnership with Achieve. The passage of the Every Student Succeeds Act (ESSA) in 2016 led a significant increase in states valuing measures of career and college readiness in their accountability systems, which has the power to truly transform districts and schools across the country. With nearly every state’s ESSA plan approved by the U.S. Department of Education, states are in the process of actually designing their new or revised accountability systems, including developing business rules and guidance to locals on data collection and designing report cards. To help states design and implement the most meaningful career-focused indicators at this key moment in time, Advance CTE, Education Strategy Group (ESG) and the Council of Chief State School Officers (CCSSO) are developing a series of career-focused indicator profiles organized around the four types of measures recommended in Destination Known: Valuing College AND Career Readiness in State Accountability Systems. Today, we are releasing two on Progress toward Post-High School Credential and Assessment of Readiness. These profiles explore how leading states, including Delaware, Ohio, Tennessee and West Virginia, are designing their indicators to ensure they are based on quality, validated data, are inclusive of all students, and are aligned with meaningful outcomes. They should serve as a resource and inspiration for states working on similar indicators. In the next few weeks, Advance CTE will be releasing two additional profiles on the other categories defined in Destination Known: Co-curricular Learning and Leadership Experiences and Transitions Beyond High School. And, in the coming months, we will release our third edition of Making Career Readiness Count in partnership with Achieve, ESG and CCSSO. Stay tuned for more! High school stude nts at Tolsia High School in West Virginia have created an industry-validated carpentry business within their classroom. Students at Haynesville Junior/Senior High School in Louisiana are connected with physical therapists, diesel mechanics, a marriage and family counselor and other industry professionals on a biweekly basis through virtual “micro-industry engagements.” In North Dakota, nursing students can earn their associate’s degree through one of four community colleges, while taking their classes at rural hospitals and health care facilities. And in Montana, a mobile laboratory is deployed across the state to engage students around various career opportunities. These are just some of the strategies states are leveraging to ensure all learners – regardless of geography, transportation barriers or the size or diversity of their local industries – are exposed to the world of work. In West Virginia, Simulated Workplace allows students to transform their classrooms into business and is now available in every school across the state, reaching over 13,000 students. The Dakota Nursing Program, in North Dakota, leverages existing infrastructure and partnerships to turn health care facilities and hospitals into college classrooms, training over 2,000 health care professionals since its launch. 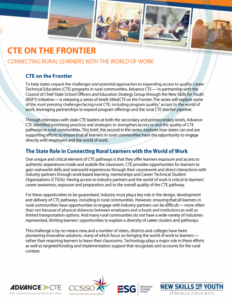 Montana is strategically leveraging federal, state and private funds to expand CTE and apprenticeships across the state in health care and other high-demand fields. While there is no simple solution or silver bullet, states are making important progress and leveraging innovative ways to bring the world of work to learners and provide the necessary resources, technical assistance and supports to ensure local communities can support and sustain those efforts. Work-based learning provides a continuum of activities â€” from career exploration and job shadowing to internships and apprenticeships â€” that help students develop technical and professional skills in an authentic work environment. 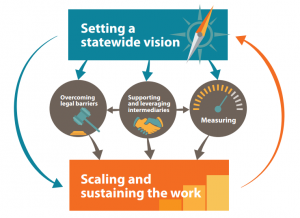 While many work-based learning programs are designed and operated at the local level, several states have begun building a data collection and evaluation strategy to ensure program quality, identify and scale successful programs, and share promising practices. 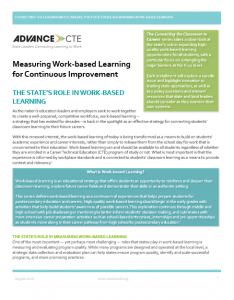 To support state efforts in this work, Advance CTE today released a brief that explores strategies for measuring work-based learning. The brief is the latest installment in the â€œConnecting the Classroom to Careersâ€ series, which examines the stateâ€™s role in expanding work-based learning opportunities for K-12 students. This issue highlights examples from three states that demonstrate either a systems-level or student-level approach to measuring work-based learning activities. In West Virginia, the Department of Education partners with industry leaders to evaluate the quality of Simulated Workplaces, student-run programs that create an authentic work environment in the classroom. Programs that fail to meet industry standards receive technical assistance from the state. And in Massachusetts, the Department of Elementary and Secondary Education uses a work-based learning plan to evaluate skill gain for students participating in the School to Career Connecting Activities Initiative. Worksite supervisors assess students on technical and professional skills at least twice during the course of the program, allowing the state to measure skill gain against a baseline. The brief, Measuring Work-based Learning for Continuous Improvement, is available on the Learning that Works Resource Center. 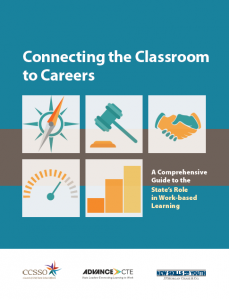 Other titles in the series explore Setting a Statewide Vision, Removing Legal Barriers, and Leveraging Intermediaries to Expand Work-based Learning. To learn more about work-based learning, be sure to sign up for Advance CTEâ€™s fall meeting, which will take place in Baltimore, MD between October 17 and 19. The convening will feature a session on state strategies for measuring and scaling work-based learning. Register by August 31 to receive the early bird discount. Earlier this week, experts weighed in on the shift from vocational education to todayâ€™s Career Technical Education (CTE) on NPRâ€™s On Point. Listen to the hour-long discussion featuring Shaun Dougherty, author of the recent study, Career and Technical Education in High School: Does It Improve Student Outcomes? The conversation spilled over into the comments section where listeners voiced their own experiences with CTE. Students can earn up to $2,500 if they plan to continue their studies in CTE, thanks to the Horatio Alger Association. Applications are accepted on a rolling deadline here. Register now for our upcoming webinar, “Kentucky Gets Students on TRACK with Youth Apprenticeship“! AtÂ 2 p.m. ET, on August 31, Kentucky leaders will discuss the state’sÂ youth pre-apprenticeship program,Â Tech Ready Apprentices for Careers in Kentucky. Join us to hear how the program started, how success is being measured and the lessons they’ve learned along the way. This webinar is part of a yearlong series on work-based learning co-hosted by Advance CTE and the Appalachia Regional Comprehensive Center. In case you missed our earlier webinars, be sure to check out the initiatives inÂ TennesseeÂ andÂ West Virginia.